Like every year, Pantone has unveiled their fabled Color of the Year, and what to say – Living Coral managed to come off as a choice that’s somehow obvious, inspired, and totally energizing, all at the same time. The thing is, this bold hue of orange has already proved to be quite challenging when working with stylish settings. Let’s take a look at a couple of ways to make this unorthodox combination work. 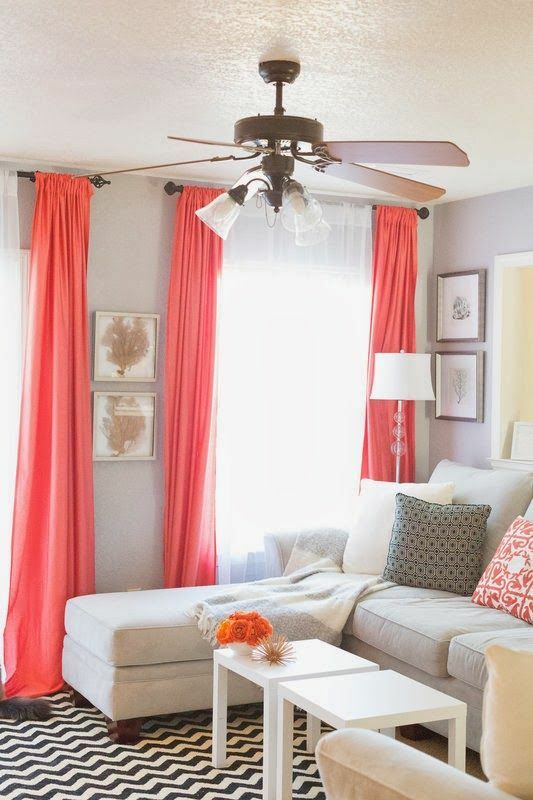 Since Living Coral makes such a strong visual impression, one would assume that the best way to use it is in combination with some appeasable pastel colors. What you should do instead is experiment with different hues of blues, greens, and charcoals to create a much more dynamic and inspiring look. No one said that drama and passion can’t be stylish. Eclectic style has always been considered a great equalizer of interior design. And truly, there is a lot of grace in how some completely odd and unique things find a way to work together. So, what do you think about a combination of soft Living Coral wallpapers, gigantic wicker double bed, a couple of complementary antique rugs and vibrant, colorful curtains? Bold? Yes. Stylish? Certainly. There are too many people who take Pantone’s recommendations a bit too seriously and repaint their walls in COY without ever thinking about how their ideas will stand the test of time. If you want to experiment with Living Coral, there is no need to be impulsive, and immediately go big. Instead, start with small accessories like vases, decorative pillows, jewel boxes, etc. If you feel they work, you can always scale up. All things retro are inherently cool and stylish. Fortunately, Living Coral was a very popular choice in the decades following World War II. It seems it vanished into obscurity only during the ‘70s. So, if you want to travel back into the past and give your room that classic mid-century feel, there is no better way than by moving in a huge Living Coral couch and combining it with a couple of retro details like old radios, gramophones, or something similar. This is yet another way to experiment with Living Coral without having to replace major pieces. Instead, you can just add simple accent colors or repaint some small details. For instance, you can weave in the hue into existing furniture textile, repaint the knobs or the entire drawers of your dressers, and give your art pieces a new frame. The possibilities are endless. There is something truly powerful about juxtaposing two equally striking colors. So, if you don’t want to experiment with tones that are complementary to Living Coral, find the one that couldn’t be more different and paint your room in two tones. A perfect example would be the space where the Living Color is used as a backdrop, while all the furniture pieces and smaller items are bright white. Corals are, after all, a marine life-form, and this color immediately conjures associations to the sea. So, why wouldn’t you then paint your room in Living Coral and sea blues, use the wallpapers with sea-life patterns, move in some interesting tropical plants and wicker furniture, and nail this concept to the ground? Stylish can be in-your-face and obvious. 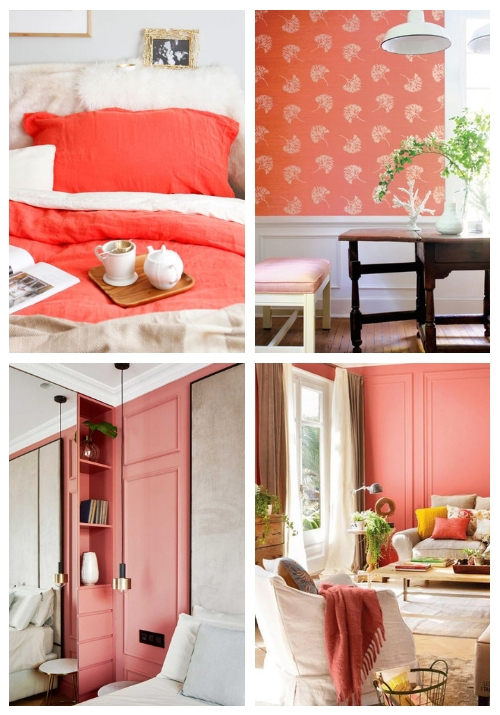 Living Coral is certainly a powerhouse color interior designers will have a lot of fun playing with in 2019. Fun, however, always includes a certain amount of challenge. We hope these six tips will help you to keep the difficulty level on “easy” and use all opportunities provided by Pantone’s pick for Color of the Year with much gusto.